Not only is Nacogdoches a beautiful and friendly place to live, it is also a safe and well-protected community. The Sheriff’s Department is charged with maintaining public safety within Nacogdoches County. The department is staffed with 26 deputies and 17 reserve deputies. Within the City of Nacogdoches, the Nacogdoches Police Department (NPD) provides the best law enforcement protection possible by maintaining highly trained personnel through continual educational programs. NPD is staffed with 66 municipal officers. In addition, Nacogdoches is served by 24 licensed peace officers in Stephen F. Austin State University’s police department, and four officers on the Nacogdoches Independent School District’s force. The Nacogdoches City-County Consolidated Communication Center is located at the NPD and is the 911 public service answering point for all city and county residents. One very important service of the NPD is the Home Safe Program, created to assist the Nacogdoches Treatment Center and Alzheimer’s Association. This program maintains a database of individuals who suffer from dementia and/or Alzheimer’s and allows the police department instant access to information for those individuals in case they become lost. 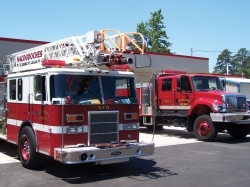 The Nacogdoches Fire Department has a full-time professional staff of 58 assigned to five fire stations strategically located throughout the city. Nacogdoches County has 16 volunteer fire departments. Nearly 225 volunteers protect outlying communities.